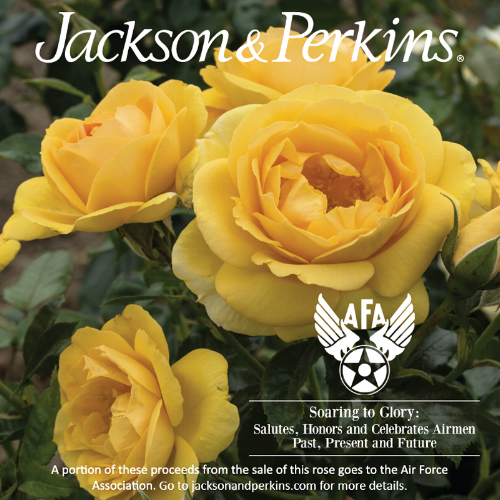 AFA is pleased to present the Soaring to Glory rose celebrating the 70th Birthday of the Air Force by saluting, honoring and celebrating Airmen - past, present and future. Be sure to purchase your very own specialty rose to plant this spring, here! AFA is proud to have partnered with Tommie Copper, the originator of comfortable compression gear to help people live comfortable, healthy, happy, lives and introducing “Wearable Wellness.” Only Tommie Copper comfortable compression products are engineered with their exclusive patented Copper Znergy® technology. Unlike competitors, their innovative technology lasts the lifetime of the garment. Their proprietary 4D stretch fabric conforms to your body for targeted compression and support where you need it most. The moisture wicking capabilities keep you cool and dry. Their patented copper and zinc technology is encapsulated in the fibers providing natural and permanent anti-odor technology by eliminating the growth of odor causing microbes. Plus, UPF 50+ protection from the sun’s harmful UV rays. Wearing the right compression gear supports your muscles and joints. Tommie Copper intentionally designs all of their comfortable compression apparel and sleeves to help relieve everyday aches and pains by enhancing recovery and supporting your moving body, every day. Pursue new physical challenges, while encouraging improved circulation, reducing pain, muscle soreness, swelling and fatigue. We want you to feel good. Begin your wellness journey today. Shop Tommie Copper by clicking here or use code AFA30 to enjoy 30% off your purchase.